A quick look at some common misconceptions NYSLRS members have about their retirement benefits. When you’re about 18 months away from retirement, think about requesting a NYSLRS retirement estimate. Your retirement date’s a year away: time to think about what you need to do to get ready. Some NYSLRS members may be eligible for additional service credit for their unused, unpaid sick leave at retirement. New year, new goals. Here are five pre-retirement goals we think NYSLRS members can reach in 2015. If you get divorced, your ex-spouse may be entitled to a portion of your NYSLRS benefit. What will your life be like after retirement? Time to start post-retirement planning. What Makes Up Your NYSLRS Pension? 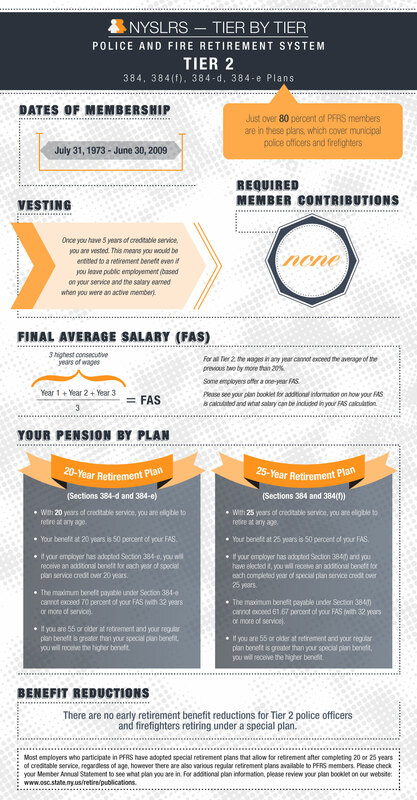 There are three main parts that make up your NYSLRS pension. Do you know what they are? Want a preview of what your retirement benefit could be? A NYSLRS retirement estimate can help with that. The first in a new blog series all about NYSLRS retirement tiers. Thanks for following us this past year. Keep an eye out every Wednesday for posts from NYSLRS. Content last revised February 25, 2015. This entry was posted in General News, Members, Retirees and tagged ERS, New York State & Local Retirement System, NYSLRS, NYSLRS Retirees, PFRS, retirement, retirement planning, Top 10 on February 25, 2015 by NYSLRS. If you’ve taken a loan against your New York State and Local Retirement System (NYSLRS) contributions, please remember to pay it back before you retire. An outstanding NYSLRS loan balance at retirement will permanently reduce your retirement benefit. You can’t make loan payments after you retire, and the reduction doesn’t go away after we recover the funds. Members who retire with outstanding NYSLRS loans that exceed the federal limit for non-taxable loans may face significant tax consequences. Part or all of your loan balance may be considered taxable funds that were credited to your account and would be subject to federal income tax in the year that you retire. Also, if you’re under age 59½ at the time your loan becomes reportable, you may be subject to an additional 10 percent penalty tax. For the payoff balance on your NYSLRS loan, call our automated phone service toll-free at 1-866-805-0990 or 518-474-7736 within the Albany, New York area. For information on how to make additional payments or increase your loan payment amount, please visit our Loans: Getting One and Paying it Back page. This entry was posted in General News, Members and tagged ERS, Information is the Key, Loans, members, New York State & Local Retirement System, PFRS, Preparing to Retire, retirement planning, tier on February 4, 2015 by NYSLRS.